Mix cream cheese, milk & cooked chicken together. Unroll crescent roll triangles & place a spoonful of chicken mixture on crescent roll & roll up. (I usually end up needing 3 packages of crescent rolls - it just depends on how big you make the rolls. Cook for 20 mins @ 350. If you want, you can heat up 1 can of cream of chicken soup +1 can of water to make a gravy. We sometimes do & sometimes don't. When it comes to the crescent rolls, I typically am a generic shopper and usually use generic, however one week when making these, the real deal crescents were on sale, and man they were SO MUCH BETTER! Spring for those if you at all can! It's well worth it, I promise! Mix everything together in a bowl, adding sugar last to taste. If I'm shredding my own cheese, shred it first on a box grater and then shred the apple - the apple juice will help you get any excess cheese off of the grater. I also typically shred my apple directly into the bowl I mix it in so taht I don't lose any of the apple juices - they make it easier to mix everything up. If your cream cheese isn't softened, it takes a little longer to mix it up, but it will reach a nice creamy consistency. Serve with Ritz crackers - this dip has always been a big hit for me! 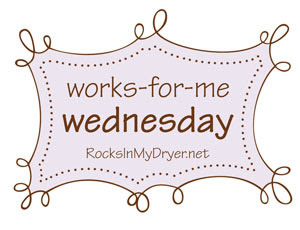 Now for other great WFMW Five Ingredients or Less recipes, head on over & see Shannon @ Rocks in My Dryer!